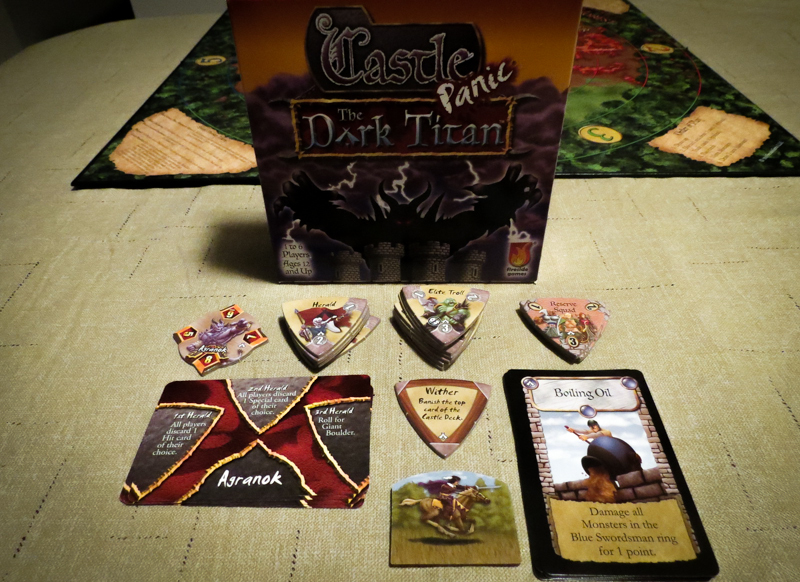 I’m not going to be going over how to play Castle Panic in this review, but if you want to learn more about the base game, definitely take a look at our Castle Panic review. Here we’ll take a look at what comes in each of the three Castle Panic expansions and how they change the game. I’ll also be letting you know how much we liked each expansion and if any, all, or none of the expansions are worth buying if you already own the base game. I will start by saying that pretty much everyone I’ve played Castle Panic with has been a fan, which is why it’s on our Top Family Games list. Did these expansions make the base game better? Let’s take a look! The Mega Boss Monsters! These monsters are very tough and are different shapes than the regular monster tokens. When setting up the game, you’ll randomly add in three of the six Harbinger tokens, which will tell you the Mega Boss Monsters you’ll be facing when you pull them out of the bag (awesome new bag, by the way). You’ll also find some other monsters in the box that have their own special abilities. Even little annoying Imps will be summoned from time to time! Another cool new addition is FIRE! There are monsters that breathe fire at your castle, and there are also new cards that allow you to set the monsters on fire! If you know how to play Castle Panic, you’ll have no problem mixing the new stuff from The Wizard’s Tower in and playing right away. The reference cards are fantastic and none of the new cards or monsters are confusing at all. This is our favorite of the three Castle Panic expansions. The Wizard cards are still the best addition to the game yet, but we’ve liked pretty much everything that came in this box. The game still fits in the “family board game” category with this expansion, but The Wizard’s Tower makes it much more challenging. This is definitely the expansion to get if you want to make Castle Panic more of a gamer’s game or if you want just one of the three expansions. Check out Wizards Tower at Amazon. The Cavalier is great! When you get his card, you place the token anywhere inside of the Swordsman ring. Then, at the end of your turn and before moving monsters, you can move him and deal some damage to the monsters. As long as a monster doesn’t deal two or more damage to him, he stays on the board. Agranok is the big eight-point monster that comes in the box, and he is tough! When playing with The Dark Titan expansion, you’ll choose one of Agranok’s five cards to use (each has a different difficulty level). As you play through the game, Herald tokens will come out and will be placed on the Agranok card, activating one of the three effects. Once three Herald tokens have been placed on the card, Agranok himself hits the board. When future Herald’s are drawn, you’ll roll a die to activate one of Agranok’s special abilities. Other than that, he acts like any other normal monster. The support tokens are probably the most underrated part of this expansion. It’s really fun trying to get them to the castle to activate their special abilities, which include fixing walls, allowing players to draw more cards, and attacking monsters. Even though The Dark Titan is our least favorite of the three expansions, it still really does make the base game better. All of the new monsters, including Agranok, make the base game just a bit tougher, so we would recommend this to people who who want to add just a little bit more content to Castle Panic. Check out Dark Titan at Amazon. The engineer is awesome!! It used to be that you’d feel a bit let down when you’d draw a brick or mortar card, but now with the Engines of War expansion you can use the new versions of those cards in new ways. Throughout the game you’ll be using the resource cards to give the engineer tasks to do, including building walls, barricades, traps, pits, ballistas, and catapults. The two pieces of equipment that you’ll want to build ASAP are the ballista and catapult since they do the most damage and can stay on the board. To use them, you’ll need to discard two cards and they need to combine to match the color and ring where you want the ballista or catapult to hit. The ballista does two points of damage to the monster you’re targeting, then one point of damage to all of the monsters in the ring behind that targeted monster. The catapult does a whopping three points of damage in one space, either to just one monster or distributed between multiple monsters in that space. This expansion introduces three Siege Engines to the game. These new tokens each have special abilities and also carry additional monsters with them. When you take down the Siege Engines, you’ll then have to deal with the Orcs that were riding in them. Encampments are yet another new tough type of enemy token you’ll have to deal with. Both Encampments sit in the forest and don’t move when the monsters move. The Barracks forces you to put the first monster you draw each turn into its arc, making it very tough for players to contain that arc. The Forward Camp allows any future monsters placed in that arc to start one space forward (the Archer ring on most cases). We were absolutely destroyed the first couple of times we played with this expansion. It’s very easy to get caught up in building new structures and forget that you need some of those cards to fight off the monsters. It takes a few games to get used to, but it’s yet another excellent Castle Panic expansion. In fact, a few people in my group like this one a bit more than The Wizard’s Tower. Check out Engines of War at Amazon. We really didn’t expect to like all three expansions, but they all really do make Castle Panic better. 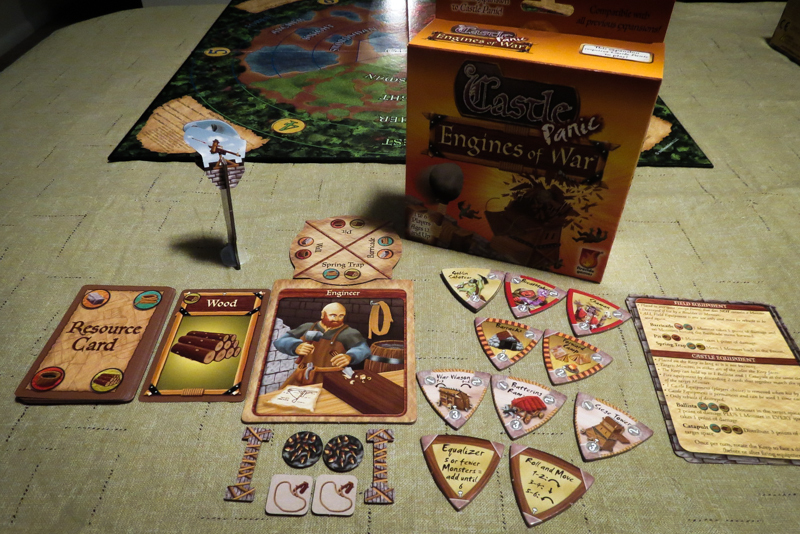 The Wizard’s Tower is still our favorite, but Engines of War is a very close second. The Dark Titan’s certainly nothing to sneeze at either since it does introduce the Cavalier and the biggest, baddest monster in the game. We have played a game with all three expansions mixed together, but we prefer to use just one per game because it’s a little too chaotic with all of them. We had to check the rulebooks many times to see how the different cards and tokens interacted with each other, which was a bit of a pain. 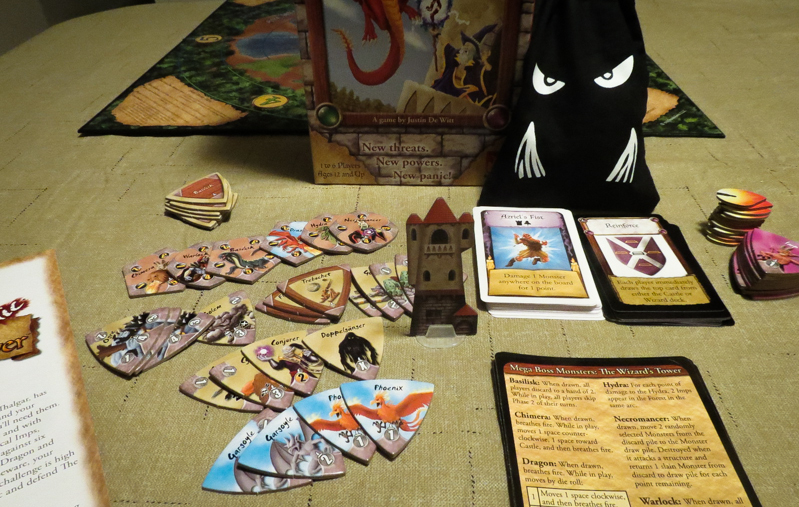 If you only want to get one of the Castle Panic expansions, I would definitely suggest getting The Wizard’s Tower since it adds plenty to the game without upping the complexity too much. 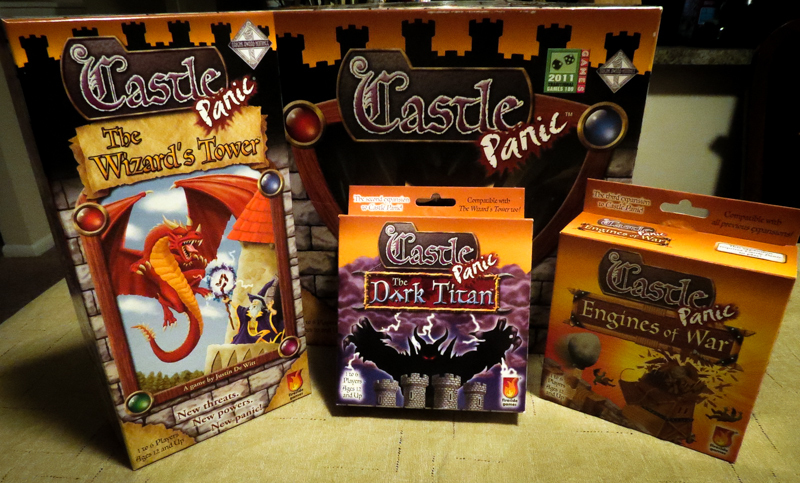 However, if you love Castle Panic and want a bunch of new ways to play it, you should at least test out all three of these great Castle Panic expansions. Thanks for taking the time to read our Castle Panic expansions review!